His All-Holiness Ecumenical Patriarch Bartholomew was born in 1940 on the island of Imvros (Gokçeada, Turkey), and elected 270th successor to the 2000-year-old Church founded by St. Andrew as well as Archbishop of Constantinople-New Rome, and Ecumenical Patriarch. He is the spiritual leader of 300 million faithful. After completing his undergraduate studies at the Theological School of Halki (1961), he pursued graduate studies at the Pontifical Oriental Institute of the Gregorian University in Rome, the Ecumenical Institute in Bossey, and the University of Munich. The Ecumenical Patriarch has worked to advance reconciliation among Catholic, Muslim and Orthodox communities, such as in former Yugoslavia, and is supportive of peace building measures to diffuse global conflict in the region. He has also presided over the resurrection of the Church of Albania and the Church of Estonia, proving a spiritual and moral support to Orthodox countries emerging from religious persecution behind the Iron Curtain. His efforts to promote religious freedom and human rights, have placed him at the forefront as an apostle of love, peace and reconciliation, earning him the Congressional Gold Medal by the United States Congress (1997). Perhaps no other church leader in history has emphasized ecumenical dialogue and environmental awareness as a primary intention of his tenure. He has chaired Pan-Orthodox gatherings, organizing educational seminars, and initiating unique sea-borne environmental symposia throughout the world over the last two decades. He organized annual educational seminars in Turkey (from 1994 to 1998), as well as biennial international, inter-religious and inter-disciplinary symposia drawing world attention to the degradation of the Mediterranean Sea, the Black Sea, the Danube River, the Adriatic Sea, the Baltic Sea, the Amazon River, the Arctic Sea, and the Mississippi River (1995-2009). In 2012, he inaugurated a series of intensive international conversations, known as the Halki Summits, engaging leading specialists on a focused ecological theme. 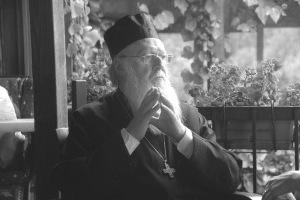 These and other such endeavors have earned Patriarch Bartholomew the title “Green Patriarch” and the award of several significant environmental prizes. The Guardian in London recognized him as one of the world’s leaders in raising environmental awareness.